Add some cheer to the chilly days of winter with these pretty fingerless gloves. They’ll keep your hands toasty warm and brighten up your day. Best of all, because they’re fingerless, you can still craft while you’re wearing them! 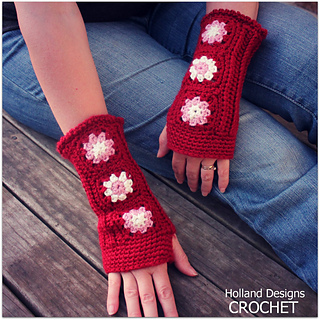 Sample pair were crocheted using Red Heart Soft aran weight yarn and crochet hook size f (3.75 mm). You’ll also need a yarn needle for some minor assembly. You’ll need approx. 200 yards main color and small amounts of 2 contrasting colors for the flower motifs.